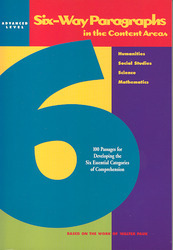 Six-Way Paragraphs in the Content Areas teaches the essential skills and techniques needed to organize, understand, and apply information in four general categories: the humanities, social studies, science, and mathematics. Concentrated skills. Focuses on the six skills that will help students read successfully. High-interest nonfiction at every level. Engages students with a wide variety of readings in each category. 100 passages in every book. Four reading levels in each book with 25 passages at each level improve reading skills and ensure mastery. Comprehensive lesson on the six vital skills. Provides in-depth explanations and examples for each of the targeted skills. Diagnostic Chart and Progress Graph in each book. Help monitor progress and determine which skills need additional practice. Brother, Can You Spare $100,000? In or Out of the Water? Can the Earth Feed Its People? Can We Get Rid of Some Zeros? Which House Is the Bauhaus? Is lt Real, or Is lt...?